Mr Adam Laker, the General Manager of the Fairmont Hotel Vancouver hotel, would like to welcome you. Fairmont Hotel Vancouver is an iconic city hotel and reflects timeless luxury and history of Vancouver. Holding a prime downtown location the property is minutes away from some of Vancouver's biggest attractions including Granville Island, Robson Street shopping, Stanley Park Seawall, Vancouver Aquarium, Gastown, Canada Place and Science World. Guests will feel at home as the hotel canine ambassadors welcome them and a knowledgeable Concierge team is available to help with local travel suggestions. Vancouver is a city on the edge of nature. Vibrant culture, dining and shopping is available for travelers who will also be inspired by the beautiful parks, mountains and beaches. Notch8 Restaurant & Bar is located in the lobby and features West Coast cuisine, extensive wine offerings and vibrant cocktails. Hotel amenities include a state-of-the-art health club, indoor pool, Absolute Spa and Sitka Physio & Wellness. 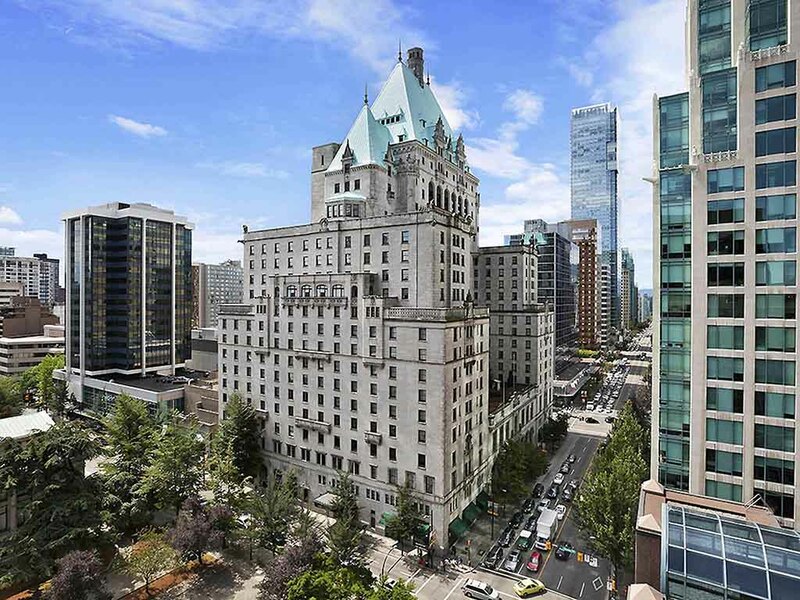 Fairmont Hotel Vancouver will continue its guest room renovation project with the addition of 8,000 sq ft of new meeting and function space. Renovation floors will be closed, construction is limited to 09:30am - 5:30pm, minimizing any impact to guests. Notch8 welcomes a new era of glamour in the lobby of Fairmont Hotel Vancouver with a luxurious atmosphere and classic cuisine inspired by the romance of travel in the 1930's. Notch8's private dining room hosts seasonally themed Afternoon Tea. Featuring Fairmont's signature tea blends, and a tea tier finger foods inspired by the theme, including savory finger sandwiches, scones and desserts created by our in-house Pastry Shop. Enjoy great wines and classic cocktails in an exciting setting at the center of the city. Live entertainment and a great atmosphere make this a locals favourite. I don't know how many of these I can fill in on a regular basis, but my stays continue to be amazing at the Fairmont hotel Downtown Vancouver. I am a regular customer of the Gold Floor and all the staff, led by Darren Kingbell continue to exceed expectations. Darren, Wilson, Lauren, Yuki, Melanie, Gayle, Zuki, Yuvraj are simple the best there is out in the hotel hospitality business. This city and hotel is my home away from home. Thank you for always welcoming me and making our stays so wonderful, whether it is for business or pleasure. I really don't have any complaints. As well, it is always a great pleasure to catch up and be greeted by wonderful smiles from David Reid, Emiko and Debbie at the Concierge Desk on the main floor - they too, are the best in the business. Congrats on continuing to exceed expectations to Adam Laker, GM and his staff at this historic and beautiful hotel. We had a wonderful stay. The only issue was parking in the area is very scarce and parking at the hotel is very expensive. Upon checking into our room, dirty towels found on the bathroom floor. With further inspection, did not appear if the bathroom was fully cleaned. We asked for a room change and were advised it would take 5 to 10 minutes. We were offered fresh fruit as an apology. Total time to find a new clean room for us was about an hour. We subsequently missed our dinner reservations. Having to find a new place to eat with two children took more time than anticipated. Upon returning to our new room in the evening, we found our fresh fruit platter that consisted of one apple, one pear, one banana, two strawberries and a handful of blue berries. I advised the front staff on check out of the issue and they advised that a manager would contact me. I recieved an email from the manager later that evening with an apology for the issues on check in and to advise he will waive 50% off our room charge. I did respond with an email to explain what our experience had been. The manager did reach out again to say he would offer a free room upgrade on our next stay. I understand that we were compensated for 50% of our room charge and a sparse fruit platter (that we couldn't enjoy as our dinner was pushed out as well). The overall experience was disappointing for us. For what was planned as a night out downtown with the family turned into something we didn't expect from the Fairmont. Yes we were rebated money, but I feel it goes beyond that, as the experience was not the greatest. I was hoping the Fairmont would do more to make it right, as I honestly dont know if we would chose this hotel in the future. Just not what we had expected. stay was OK. Stupid, repeated survey requests extremely annoying. Overall it was ok. I wouldn’t be rushing back to stay. Bathrooms are tiny with no fan. No coffee shop, no cocktail lounge. Restaurant closes really early on a Friday and no option for late food (even room service). Everything was very nice. My only complaint was the service elevator which hidden somewhere near our room. It made a lot of noise which we found rather disruptive and made it very difficult to sleep. I shouldn't have signed up for the auto upgrade. Rooms were not any better than the standard room. Plus, when we checked in the reception were looking for upgrades for us anyway before they discovered we had signed up for the auto-upgrade (which was nice). Mini-bar fridge was completely full of stocked items and barely room for me to put my own stuff in there. Putting my stuff in there caused a sensor to trigger that I had removed something, causing an erroneous charge on my bill. Which meant that I couldn't do the express check out and had to visit the cashier to have it sorted out. The best of the major Vancouver hotels that we have stayed at. The room, the people and facility surpass the rest of the higher end hotels in Vancouver. We have stayed at the Sutton, Wedgewood, Hyatt, Met, Georgia, Sheraton Wall Center. And the Fairmont rates are competitive. Fairmont Vancouver guest service was excellent. We arrived at the hotel late in the evening, after a long day of work and then travel. The customer service that Ygor provided while getting us checked in put a pleasant end to an exhausting day. Throughout our whole stay everyone was extremely helpful. Staff were very friendly and helpful. Room was very nice. convenient location. nice restaurant/bar. comfy bed. need to serve coffee in the Lobby past 6:30 am! Fairmont is always a nice experience. Décor is lush, beds are comfortable. I just find the rooms do not accommodate the female business traveler very well. The bathroom is nice, but there is nowhere to put a makeup bag or hair things. The mirror is up pretty high, and there isn't an extendible makeup mirror to use. I could use the mirror on the wall in the room, but again, nothing to put the makeup on and it is dark there (too dark for makeup application). This seems like a hotel where older male travelers would feel comfortable, but as a female business traveler Marriot does a better job. Had a really nice stay! Beautiful hotel, comfortable rooms, walking distance to Robson St, Gas Town, Yale Town! Parking is $$$ but it is pricey everywhere in downtown. A little confusion with NOT getting a discount on my parking for bringing by Hybrid car(must use Valet and not self park). Communicated with management about frustration with check in and they made good by promising complimentary parking next time. Fairmont Vancouver is always a great choice as far as location, service & comfort!! I have stayed at this property many times and kept returning. My employer is a major account with Fairmont. I am also a Platinum President's club member. Upon check in I requested an upgrade. I was told I already have one based on the corporate account. I presented my Fairmont / Accor platinum card and the front desk fellow said something to the effect that he would upgrade me to a very large room. After receiving the key I asked if my colleague (from my company) could also get an upgrade and the fellow said yes. Upon arriving to my room I was shocked. The room was probably 300 square feet. It is the smallest room I have ever had at this property. My colleague came by and laughed. As a non-member his room was probably double in size. I spent 5 days in that room. I am returning to Vancouver on two separate occasions in May. Needless to say I won't be returning to this property. The first visit is with your competitor. The second visit is at the Pacific Rim. If that experience is anything like my recent visit I won't be returning to any Accor / Fairmont hotels and will ensure that my team members and colleagues, who also typically stay at the Hotel Vancouver, look for better options. Very happy with the staff accommodating for a super early arrival. Check in and out was extremely simple, and the hotel is situated in a great location downtown. Our First Time Staying at a Fairmont Property will Most Definitely NOT Be Our Last! The hotel was Fabulous!! The service was outstanding! We were treated like valued friends rather than customers. I can't say enough about how impressed we are with the entire Fairmont chain. Hotel is spotless, well maintained and updated. All staff were extremely helpful and friendly. Loved the sweet labs at the Concierge Desk!